Have you guys noticed about Facebook new update on Facebook Ads? It was released on 18th October. You can read a full article from Facebook here. According to these update, I think that our viral quiz website Ads on Facebook will also suffer these changes. That’s why, since August, we got Ads disapproval very frequently. 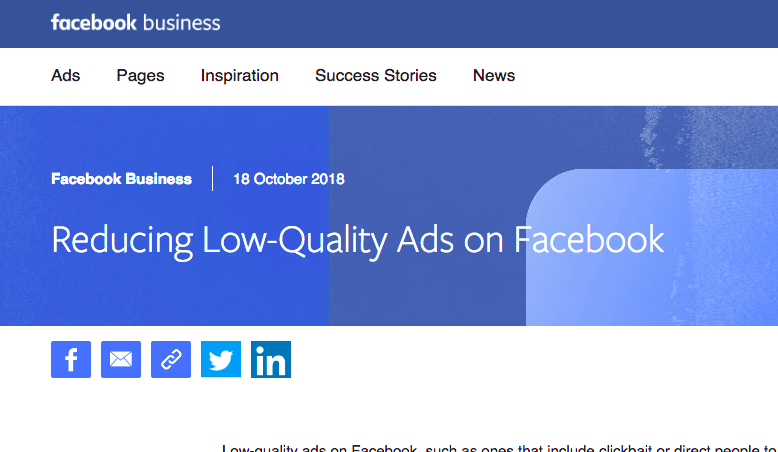 Now it is confirmed that low-quality Ads will have more negative effect. What can we do about it? Any solutions? Hi.. i am your regular reader, I learned a lot of from you… thank you for that. Now I am planning to start a new facebook viral quiz website but I have some questions, I hope you solve that. 1: for the new website my budget is low, its around $150 for script and hosting + domain, it’s sufficient? 2 = i want to buy ffscript but sins a month the website is not working and I think it now not in this business so can you suggest me any other script? 3 its still a good idea to create a new viral website? can we still earn from it? or its bad idea now a day? Hi bro, with 150 USD it is sufficient enough to run a viral website with phpviralquiz.com. It will cost 89 USD for the script. For the hosting, you can start with 10 USD per month plan with Digital Ocean. FFscript is down at the moment and not available at the market. Even you get their script, you need activation code to run the script. For question 3, it is quite difficult to answer. Which country are you focusing for your website? And do you have highly engaging Facebook pages. During these days, it is very difficult to create Facebook ads for viral quiz website, but you have Facebook page with active fan, you can easily make your quiz viral. i visited phpviralquiz.com but i think they don’t have more features like socioquze and ffscript. but i think now we don’t have any other option. my country is India, and for traffic, I have two Facebook page with 10k and 12k likes and its reach average 1k of every post. i have a budget of $5 for boost but as you said now facebook ads is difficult now day. phpviralquiz.com will be enough to run viral quiz site. I would recommend you to start with your Facebook page and then later you can boost your Ads. Use TLD domain like .com. what’s the problem with our quizzes? ?